The 20/20 Diet is the newest weight loss book written by Dr. Phil McGraw and he has been promoting this plan via his popular TV show. Dr Phil McGraw first appeared in the public eye on the Oprah Winfrey show. With a background in medical psychology, his insightful wisdom enabled many people to start believing the “truth about themselves” – rather than the lie. As a counselor he confronts and communicates with people, asking them empowering questions, and assisting them in becoming free from some of the issues and problems in their lives including bad relationships with food and root causes of obesity. In a nutshell, Dr. Phil’s 20/20 Diet focuses on addressing the roadblocks that keep dieters from success and then asks people to begin their new weight loss journey by eating just 20 foods. For each of the listed roadblocks or ugly truths, Dr. Phil gives readers the latest research surrounding them and then practical strategies for overcoming each one. For the first 5 days of The 20/20 Diet you will eat only the 20 prescribed foods in various combinations and recipes. These foods are designed to cleanse your palate, enhance your body’s natural thermogenesis, keep you feeling satisfied, and promote weight loss. By using just 20 foods, this diet is designed to be a simpler way for dieters to get started with healthy eating, stick to their diet, and make grocery shopping and food prep easier. The 20/20 Diet book, which includes meal suggestions and the step by step plan retails for $26.00. Dieters may spend a little more on food since cheap processed foods are eliminated. Before the 20/20 Diet Dr Phil designed a weight management plan that was aimed at healthy thinking as well as healthy eating. This is good, because healthy thinking leads to happiness. Many people eat when depressed, and it can often lie at the root of many weight problems. 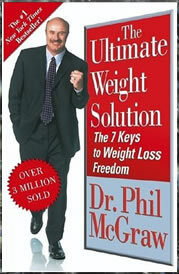 He outlines the plan in his book The Ultimate Weight Loss Solution: The 7 keys to weight loss freedom. This is a sustainable, long term plan that may assist you and your life in more ways than just losing weight. Note that the book is fairly limited in terms of an eating plan (e.g. the one size fits all technique). This is not so much about nutrition, but addressing causes of emotional eating. 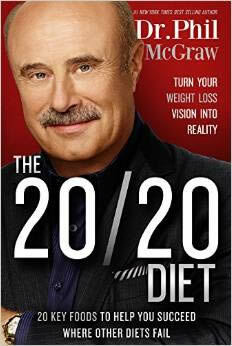 Dr. Phil’s 20/20 Diet is a great tool for dieters to use to learn to eat healthier and to slim down. Both of his popular diet books offer sound advice and address many of the emotional roadblocks that keep people unhealthy and fat. His many years of experience as a phycologist is evident in his work and approach. Dieters that may need personal support might find 20/20 a little lacking, especially if they are not supported by their families. Overall, a great plan for those that respond to a self-help type of approach and those who are committed to cleaning up their diet with Dr. Phil’s prescribed foods. Six years ago my mom was way into the Dr. Phil show, and she bought this book and went on the diet. I did it with her. The thing I liked about this diet was the detox part of it. Along with exercise, I lost over 20 lbs in 1 month. After the detox, I found it impossible to eat any fat or sugar. Fat made me feel sick and sugar hurt my joints and bones! Weird thing to say I know, but it really happened. Then I got a job as a cook at a restaurant and started to pick at the fried food, and slowly my body started to tolerate it and my eating habits went down south. I didn’t put the weight fully back on till six years later. To this day, I can’t drink pop like I used to. Now that I’m engaged, I decided to give this diet plan another go, and can’t wait to feel as great and energetic as I did before! For everyone else that knocks this diet, maybe you didn’t follow the first detox part of it strictly enough. You have to not cheat at all, you can’t even eat bread! I’ve always had great luck with Dr Phils Diet. THe best part is after about 4 days I get a huge boost of energy and clarity. I just cant seem to stick with it lately, but once I get going with it, it really works. It works. I’ve been on it for 2 1/2 months and have lost 46 pounds and I’m still losing (I still have a long way to go). I’m not hungry and on average I’m only eating 1400 calories per day. The hardest part has been eating more protein than I’m used to. I honestly don’t know how someone can gain 25 pounds only eating 1400 calories per day. Somehow I don’t think they were really on the diet. The biggest criticism I’ve heard (other than the supplement thing) is that 1400 calories per day may be too little for some people and it’s too “one size fits all”. Nobody is saying that it causes weight gain. I agree. Far too restrictive. Tried it for a while. Went pear-shaped. This diet is ridiculous- way too small portions and restrictive. I wouldn’t advise anyone to ever follow any advice this guy gives. He is so full of himself,did anyone ever notice he only tells people what they want to hear? im very happy with the results and im glad that i was able to loose a lot of weight freely….thanks very very much…..im amazed by this…..
Actually yeppers, he’s obese. He’s 250 lbs and 6 foot 4 inches… Eh, he’s just getting older and enjoying himself a bit more, just focus on yourself and instead of watching Dr. Phil, pick up and excercise routine, and all will be well… I don’t Dr. Phil because he makes me sick… And wow! I’m happy! As a student, and doing a project on Dr. Phil’s diet, I am not able to find any recipes on the internet, so I’am unable to make a diet meal for my class to try, if any of you know about one of his recipes please let me know. LOL haterzzzz . . Dr Phil is NOT overweight in any way. He’s a moderate eater and takes care of himself. Just cuz some of you think you can say “I’m on a diet” and still eat according to your old habits, you get pissed when you ::surprise:: DON’T lose any weight. under any other circumstances i would think that losing 20 lbs in two weeks was pretty good, but trying the 3 day diet is so much better and more efficient. in just 3 days you can lose up to 12 lbs. and if you incorporate it into your schedule you will lose so much more. do a 3 days dieting then 4 days off kind of thing. i know someone who did that for almost a year and lost over 200 lbs no kidding. you think Dr. Phil is overweight???? are you kidding me???? what a joke. I tried it and gained 25 pounds over 3 months, my girlfriend broke up with me, my drain stopped up, and the cat ran away. Only in America can a fat guy sell a diet plan. if dr phils diet works why is he over weight? What does this diet do to lose weight? If you lose the weight can you get off the diet and still keep the weight loss? IS THIS DIET PERMANENT? heyy! this diet actuly worked! i lost 25 pounds in just a few weeks!